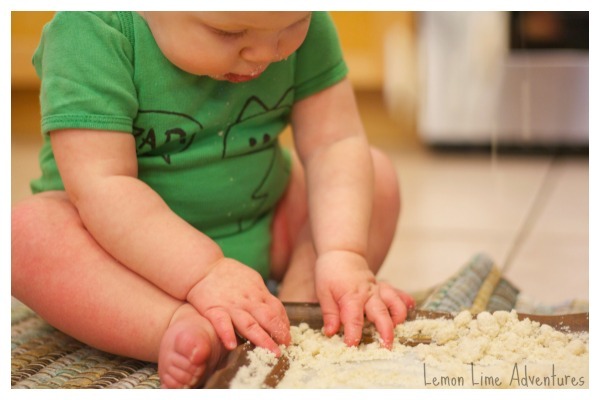 We love Sensory Dough in our house. 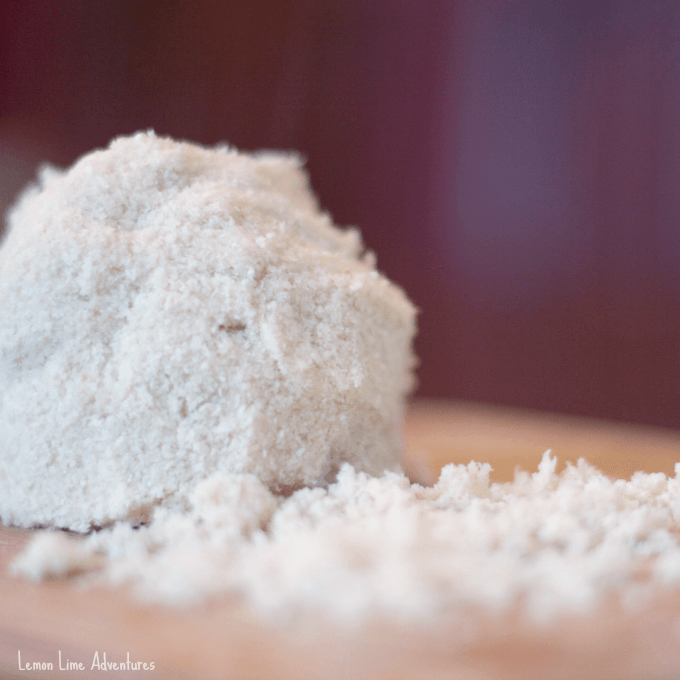 In fact, each month we are exploring a new kind of dough, experimenting and linking up with other bloggers to tell you about it. Last month, we experimented with proportions as we tried our hand at Foam Dough. This month, we have been gearing up to experiment with Cloud Dough. Except this month, something is different! This month, we have an 8 month of baby getting into EVERYTHING we do. That is why I had to figure out an organic, baby safe cloud dough recipe. You are not going to believe the ingredients! Super B puts EVERYTHING in her mouth. I have tried teaching her “not for the mouth” to no avail. I try to keep things out of her reach, but with each passing day, that task gets harder and harder. At this point, Super B has not had many solid foods, and is definitely not at the stage to eat complex foods. I have, mostly, limited her sensory play to non-edible items. Except the one time I gave her a bin full of flour, that is when I realized that she was going to put anything I give her straight in her mouth. I mean, who doesn’t have left over rice cereal that their baby didn’t like? I know we had a whole box, practically untouched! Add 3 Tablespoons of Melted Coconut Oil to the rice cereal. Mix and let the mixture cool. The rice cereal is an amazing texture. It shimmers. Its soft and fluffy. It is powdery and flaky at the same time. Once the coconut oil is added it clumps into fantastic balls to be molded, shaped and explored. You can encourage language development by talking with your baby about the textures and the smells. Super B loved everything about this dough. She felt it. She looked at it. She smelled it. She squeezed it. She grabbed it. She spread it. Of course, she tasted it. This was one of the first times I have seen Super B explore a material for this long. She oohed, and ahhed. She babbled. She practiced her fine motor skills. She even crawled around the dish, exploring the dough from all angles. It has actually become our new favorite snack for Super B! Who would have thought we ever would have found a use for all that rice cereal? 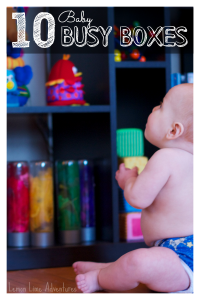 Be sure to read Twodaloo’s The When, Why and How of Infant Sensory Play, by my good friends, Sugar Aunts. 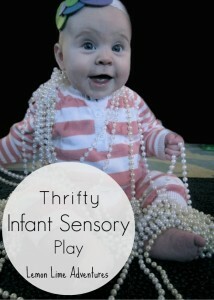 Also, check out the other Baby Sensory Activities we have done. 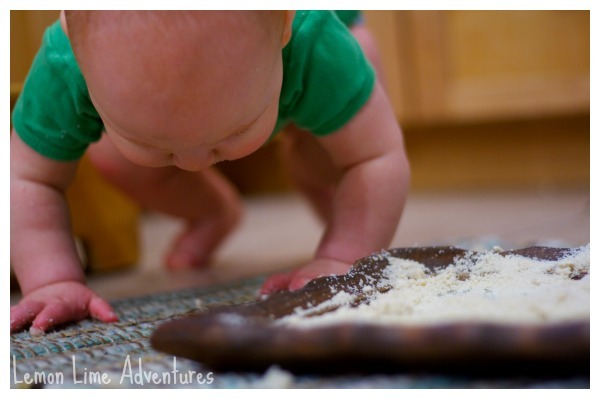 Have you ever tried sensory play with your infant? What is your favorite? I would love to hear! Follow me on Facebook, Twitter, Google+, Pinterest, Instagram or subscribe by email. I can’t wait to hear your ideas. This is brilliant I love it! I have so much unused rice cereal. Definitely trying this one! Thank you so much. I couldn’t believe it worked so well! The big boys loved it too! I have seen where people make cookies and such out of that left over rice cereal but that didn’t sound appealing. This will be done again here, really soon! This is brilliant! I have a small collection of baby-safe play doughs (because I have had a baby in the house constantly for the last six years), and I am adding this to it! There is so much potential for variation too…I love it!!! Thank you! I am so happy you like it! Super B definitely did! I can see so many variations as well. Ooh I have left over baby rice cereal! Will definitely try this out. Presuming it would work the same with other kinds of oils? We don’t have coconut, is that specifically a must?? Thanks for linking up the to Tuesday Tutorials Pin Party – Hope to see you again next week! I know right? What baby actually eats that stuff? I would love to know if it works with other oils.. Tomorrow we are posting the boys’ experiment with different ingredients to make the perfect cloud dough. Be sure to check back to see what options they came up with! Too funny! I am glad you liked it! We are so excited that it worked. That way she could play while the boys played and explored their cloud dough! What a wonderful idea! 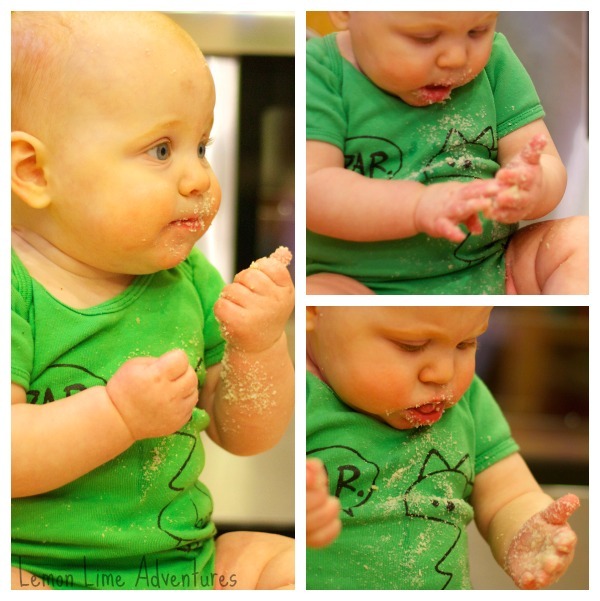 We made edible cloud dough with coconut oil and powdered sugar for the older kids, but I love that this is not only safe for baby, but “healthy” too! 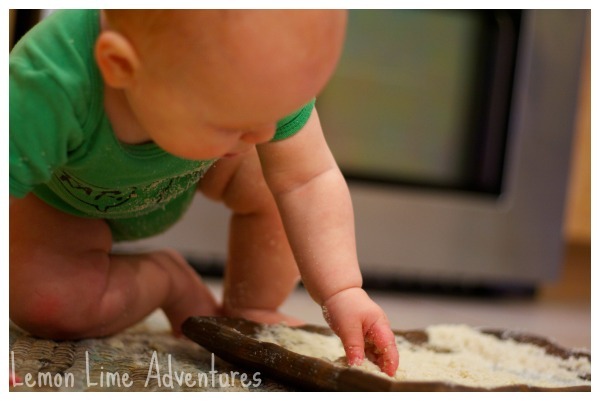 Love seeing your little one reach for the tray. Too cute! Thank you so much! I am continually surprised how well received it was and how easy to make. We have a batch constantly made now… It’s a great snack! I am going to make some of this for my youngest (11 months old)! He would love it! Wonderful! I am glad you liked it so much! What a great idea! Very clever! What a great idea! 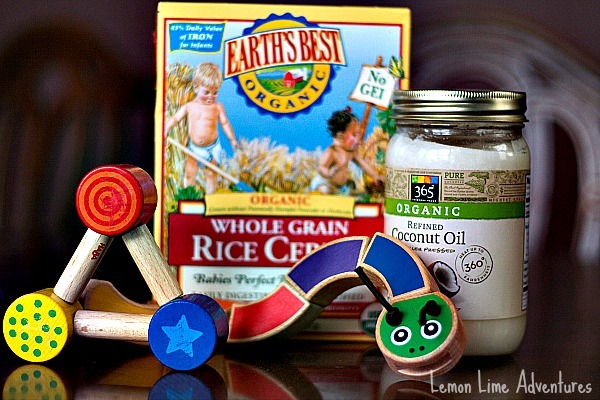 We didn’t try that, but I used rice cereal to make finger paints and it worked so well,was so gooey and fun! That sounds fabulous! I can’t wait to read more about that! Hi, can any kind of oil work with this, I ask because I am allergic to coconut. 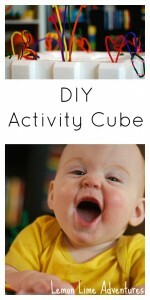 This looks like a fun activity for my littles. Yes any oil works. If you check out our cloud dough post.. we tested a variety of oils and liquids. You can definitely use vegetable oil. I tried making this but couldn’t get it to a consistency where I could make balls with it. I tried adding more cereal or oil but it just got really oily and still couldn’t make shapes. Tips?? I had the same problem. Mine looks like sand and will not clump or hold together. Made it exactly as suggested. Added a little more oil to see if it stuck together but to not avail. Suggestion? It has been a few years since I made this. I could make it again and let you know why it isn’t working. 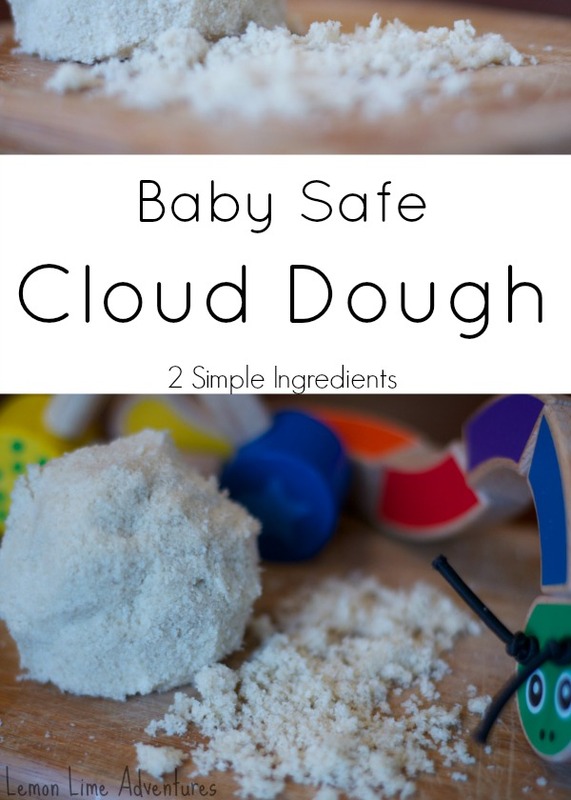 I love your idea for this cloud dough and have made a link to it in my new blog, http://thewayheplays.blogspot.com.au/2014/07/cloud-dough_29.html, please let me know if that is not OK, this is all new to me! Is there anyway to color this blue? I am not sure, you could try using food coloring or icing coloring, although if you are using it for a baby, I would suggest that you might not want to dye it. Can the oatmeal cereal be used also. I just cleaned out our cabinets and found and old box of it. Same brand, we are just past this stage and I hate to trow it away. I have not tried this yet. But you are not the first to ask… so Now I have to try it! The consistancy will be a tad different but it should work! Wonderful!! I am going to try a few! Fantastic! Can’t wait to see pictures! This worked wonderfully and is so easy! We have so much unused rice cereal, so I was thrilled to find a use for it. My little one loved practicing scooping up the “dough” with a spoon and trying to feed it to her puppy. Can’t wait to make again! I tried this cloud dough this evening and it turned out more like sand.. It wouldn’t really mold and certainly wouldn’t hold a shape it would just crumble and it almost felt like a body scrub.. I used Gerber rice cereal is that why it wasn’t the same as your result?? You might have needed more oil.